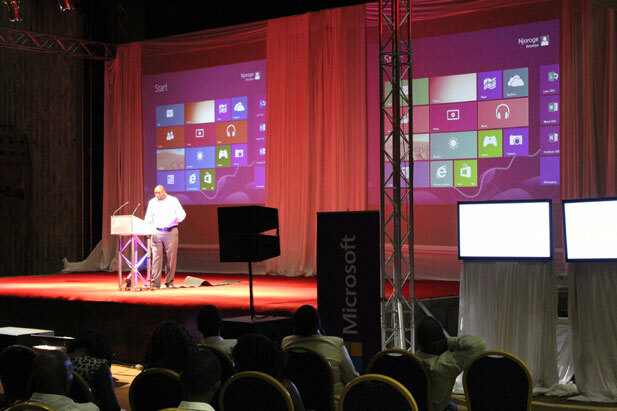 Microsoft officially launched the latest version of its operating system, Windows 8, in Harare today. The company also introduced Windows Server 2012, Office 13 and the Microsoft 4Afrika initiative among other things. The launch was officially opened by Zimbabwe’s ICT Minister Nelson Chamisa. The new Windows version has already been launched in other markets on the continent starting October 2012. In Zimbabwe, Microsoft sells its products through channel partners. Microsoft wouldn’t give any specifics on pricing just indicating that it would be around US $300. One Microsoft partner we interviewed today, WestChase Consultants, told us they are looking to sell the Windows 8 Pro would be priced at about $375. Other Microsoft partners at the event also told us they will be stocking Microsoft Surface tablets to widen their offering of the companies products. Speaking at the launch, both Chamisa and the ICT ministry Perm sec, Sam Kundishora acknowledged the problem of software piracy in Zimbabwe, which includes piracy of Microsoft products. “As a country we have been accused of pirating software. It is true we cannot deny it. We are putting our heads together as government, the ICT Suppliers Association of Zimbabwe, the Computer Society of Zimbabwe and Microsoft to sensitize and create awareness of the bad effects of piracy,” Kundishora said at the launch. On the issue, Chamisa added, “From the rankings that were done by the Business Software Alliance in terms of software piracy, our country is not faring well and it’s a source of concern for us policy makers.” The minister went on to say that as government they were working to have an MOU with companies like Microsoft that will help them implement awareness programs as well as to enforce anti-piracy laws. Chamisa however encouraged Microsoft to come up with friendly pricing terms for emerging market countries like Zimbabwe. Odipo said however that they offer special low pricing for academic institutions. He also said customers have an option to buy software on “hire purchase” where someone can buy software over say, 3 years. $300 and $375 Jesus Christ!! What are these people crazy? They gave it away for $15 dollars in the States. I even got my own licence for $50 odd. I dont know wat they have been smoking but at that price piracy will certainly win. That discount ended on January 31. Microsoft’s anticipated $14.99 Windows 8 upgrade offerfor people who buy Windows 7 PCs will go live tomorrow and last through January 31, 2013. Ubuntu please for the people! I dont think Windows 8 will have any luck being pirated. Does anyone actually like it? (rhetorical). I am sticking to Windows 7 and believe they did very well. When support ends am going to a LInux distro. It’s a matter of personal preference but I have actually come to like it. But then I also like Unity! Our good minister must concentrate on offering real solution to the poor Zimbos than giving solution to this big giants to maximise there profits. Windows 8 have nothing to offer or to cheer for to the many people who are struggling to meet daily needs. Its monster hardware needs automatically pushes prices up beyond pockets of struggling Zimbo. With Office 13, Windows 8 on the phone, tablet and laptop (and not to mention desktop), a channel partner network and normal employees (at customer sites) who do not like change, an IDE that seamlessly incorporates windowing and workflow, certified developers community, Microsoft have finally got their ducks (read Linux/Android and other freebies in one straight line. All they now need to do is move to the beginning of the line, load one bullet, take aim and ……. This is going to be fun to watch! I dont know which company you work for bt where lm we are buying computers with win 8 and downgrade them to win 7 bcoz 8 is unusable in our environment. All our storage and cloud services is happily running on linux. Our clients have 30 times more billions than SA. I don’t work for any company. I consult for large clients who implement ERPs. I have no idea why windows 8 is unusable in your environment, so I am not able to provide meaningful response to that. However, in some change management assignments that I do, I have found that people (i.e. their mindset, competencies, and preferences) are usually the barriers to technology solutions. But then, not all approaches fit all situations. In your case it might be differnt. I would start there if I was to understand why Win 8 does not work in your environment. If that is not the right place to look at, I would proceed to check the process and technology side and get that sorted out next. Ijhoo, client that have 30 times more billions than SA (I suppose you mean the country)! Wow! I should consult for you, or better still your clients! Yes l mean South Africa. The software we use is custom made and and has been adopted to every version of windows since the first release of it until win 7. Before there was there was windows there the Vax machine which everything was build from. So your guys failed to adopt it for win 8 or are they moving it to Linux? well said, we still have and running 21track computers whilst at the same time we have the latest ibm 3592-e6 tape drives and lto5. lts just seems windows 8 will be a lot of pain and to rollout and get it to speed with production. Thats real world for you. MS is well aware of that. XP, extended support arrangements end in April 2014 (http://windows.microsoft.com/en-us/windows/products/lifecycle ). But not everyone can afford it. Though at ATM its quite risky running it without support, but reality paints a different picture. I would happily use XP pre-Service Pack 3 if there were no security risks attached to it. I still hate the ribbon interface too, but not much one can do. I wouldnt miss it. We still have XP/Server2003 boxes everywhere and now moving to Win 7/Server2008R2 over a 2-3 year period. Our software is custom made and took almost 3 years to get it right so I doubt we will see Win 8/Server2012 in our production environment. “Office Professional comes with Publisher, Access and Outlook which many people will never use”… Ha!!! What rubbish, I guarantee you now many people use Outlook and really want it. I know, I have been in the game 8 years! People do not know that there is almost open source software for almost every application. So I tend to wonder why people resort to piracy. There is Linux (operating software a substitute for Windows), OpenOffice (a substitute for Microsoft Office), GnuCash (substitute for Quicken accounting software), GIMP (a substitute for Adobe photoshop) I can go on and on. The point I am putting across is that people must also be taught about open source software. After all it saves the world US$6billion every year.